Whether you call them shears, slitters, cutters, blades, or knives, we understand the metal processing industry and your needs. Bach Knives has 60+ years of metallurgical and field experience to match the right tooling specifications to your application. Our slitter knives are manufactured using state of the art materials and the latest technology and production techniques. We start with the highest quality European forged material, vacuum harden and triple temper to Rockwell held to ±1, then finish with lapping and polishing to produce the finest metal slitter knives. Our production facilities allow us to produce knives with a flatness, parallelism, surface finish and tolerance unmatched by our competition with 100% inspection before shipping. 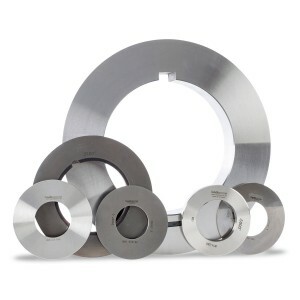 Our shear and slitter knives are used to cut a wide variety of materials from 0.0003″ foil to greater than 2″ thickness. We offer the best-suited and successful grades for slitting and shearing HSLA, AHSLA, Duplex©, stainless steels, nickel alloys, copper, brass, titanium, indium aluminum, hot rolled steels, phosph, bronze, clad, and laminated metals. Our spacers are manufactured from the finest through-hardened tool steels with the same precision tolerances as our knives. We also provide light weight executions in polyamid and tool steel. 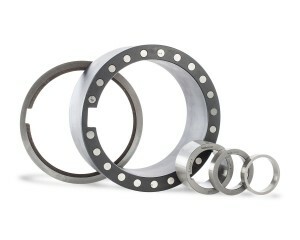 All spacers are clearly etched for easy identification. Spacers can also be made in aluminum and stainless steel for specific applications. Contact your Bach Knives sales engineer to see how our rotary slitter and shear knives and spacers will benefit your company.